Today we live in a world of self driving cars, digital transformation and oh yes ‘artificial intelligence’ (how could I miss that!). Exciting times for sure. Having done a little bit of work on AI and its variants – neural nets, genetic algorithms and robotics in early 90s, I have watched the recent developments with curiosity. On the one hand it is great to see the sudden emergence into the mainstream, of ‘AI’ with all its promises ; yet on the other hand, it is humbling to see how little has actually changed and how much work still needs to be done to solve some really tough problems. After much analysis, talking to leading researchers in the fields at Cornell, Stanford, Google etc, what is evident is that while there has been progress, much of it is incremental rather than foundational and the progress has primarily been enabled by Speed, Access and Innovation. What do I mean by that ? Let us take a couple of examples. The neural net I built in 1992 (using Backpropagation) to recognize handwritten character recognition (of numerals 0-9) took a week to train, today it will probably take 7 mins. What changed ? Computational Speed. That’s what changed! The AI technique was there then too!. Now the same neural net had to be trained at a lab some 25 miles away from my apartment. Today I could train it on my laptop or connect to it remotely from my bed!. Ubiqutous Access to resources over the web is what has made it possible. Third is the emergence of new business models. Digital retailing, Ecommerce, uberization of Transport, have all been made possible by Business Model Innovation and multidisciplinary work, which in turn have been enabled by Speed and Access. Talking of enablers, Software is the ultimate enabler and is eating the world. As a Software enterprise there is an excitement and a sense of responsibility upon us to define, develop and deploy solutions that are transformational. We take this responsibility seriously. Today the pace of change requires us to re-invent ourselves more frequently while staying true to our core, foundational beliefs. All that said, we dug deep and hard to define who we are and what we do, and have come up with a set of powerful tenets that best describes our approach, philosophy, and value proposition. These set of ‘triple-A’ tenets are Automate, Augment, and Analyze. These capture the essence of the transformational changes we can bring to an enterprise with our solutions. Our solutions handle workflow automation across a number of business functions – be it marketing, sales, operations or fulfillment. In our analysis and in talking to experts, even much of AI today is about automating routine tasks through chatbots, voice and pattern recognition. From a ‘Dev Ops’ standpoint, servers can be auto started, code can be auto generated. The possibilities are endless. The concept therefore has a long life and foundational. This is where our Automate comes from. Second, customer and user experiences are changing and rapidly so. Consumers want to consume products and services in very different ways – whether it is clothes they buy, entertainment they watch or some home remodeling they undertake. Customer experienceshave to be powerful – and include visual, tactile, auditory etc that Augment reality. Third, with the constant inundation of data, there is a need for sifting through the data, filter out the noise and extract intelligence and do it fast, in an intuitive manner. Analytics has taken on a whole new meaning with the ability of technology today to Analyze and infer patterns in petabytes of data, search for answers and develop recommendations in seconds. How does all this relate to our products and services?. In a number of ways. Let us look at it from the ‘stack’ viewpoint. Similar to a software stack, this vision can be ‘stacked’ as well. As the attached illustration shows, we construct Solutions by combining several of our Software productswith some of our Services. The software products could be from our our ReMAP portfolio, from one of our affiliate companies, or from one of the technology partner companies we work with (such as Freshworks or Thoughtspot). The Services too could be from our native ReMAP portfolio. The solutions may cover a range of business functions and workflows – Marketing, Lead Management, Field Sales, and Operational fulfillment across a variety of industry verticals – Home Improvement, Retail, Telecommunications and Advertising. Together these solutions Automate workflows, Augment experiences and Analyze information for intelligent decision making. Let us take a few specific examples to see how solutions are assembled – one for each of the three A’s. For a Home Remodeler, we can take the ReMAP Product Catalog, Sales Configurator, and Job Management, and combine these with the ReMAP Onboarding service to setup the products, assist a sales rep make an in-home sales consultation, sell a Home Improvement project, Distribute purchase orders to vendors and track the job, achieving in the process significant automation of process workflows. Similarly for a Home Remodeler or a Home owner, we can take the ReMAP Designer AR, ReMAP EC, combine with our ReMAP Visualization Service to allow a user to take a picture and import a Kitchen scene, auto detect specific objects in the scene, clean up the image, provide options to transform specific sections of the scene (such as the countertop, cabinets etc) and thereby augment the design/buy experience. 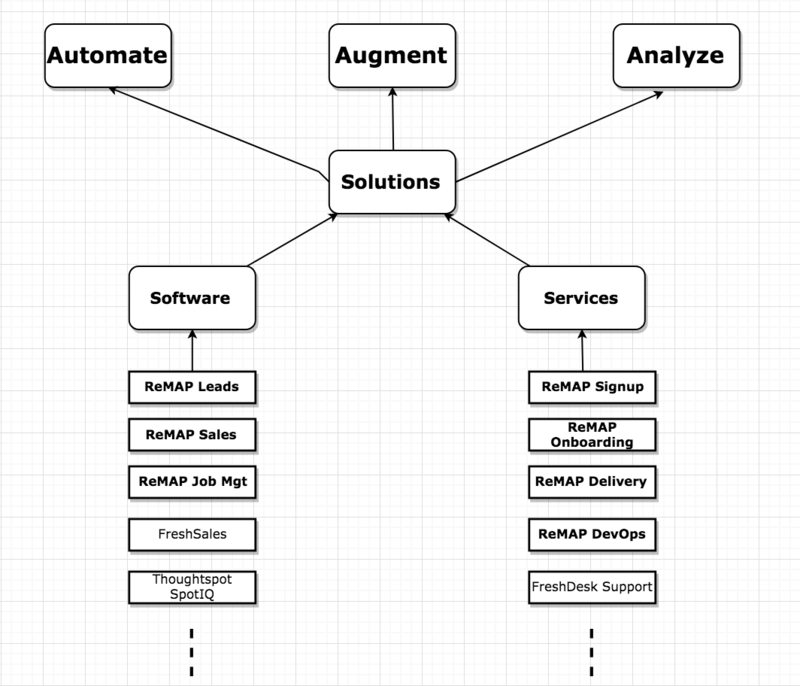 By combining Freshsales for lead management, ReMAP Sales Configurator, ReMAP Job Management, and Thoughspot SpotIQ, we create a powerful Analyze, Search and Discover workflow that allows executives in large Retail and Construction firms study patterns of lead flow, sales by geography, product etc and the cycle times of jobs. These are just a few of infinite number of scenarios that are possible across various industries, to handle complex business workflows, create powerful experiences and be able to derive business intelligence, using our approach. We will have a library of such ready-to-use workflows for us to leverage as we work with our customers. Exciting indeed !